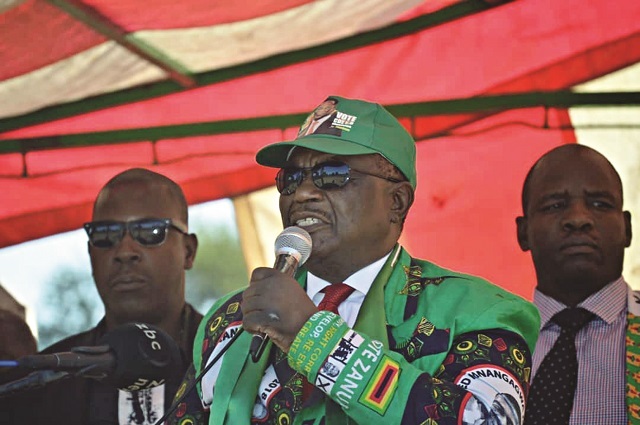 President Mnangagwa is poised for resounding victory in next Monday's elections as he has been endorsed by a cross section of the country's population, Vice President Constantino Chiwenga has said. He was addressing thousands of Zanu-PF supporters at Kingsdale in Norton yesterday. He said the ruling party had a clear development agenda to uplift the people's livelihoods. "We are left with seven days before we go to vote and after July 30, President Mnangagwa will be in office because he has been anointed by the heavens and was elected by our party, Zanu-PF," said Chiwenga. "He was accepted by a cross section of our society and that includes chiefs, churches, the business community, war veterans, the youths and the students," he said. Chiwenga said Zimbabwe was endowed with vast natural resources and minerals to spur the growth of the economy. "Zimbabwe has vast amounts of natural resources, including over 40 types of minerals that we should use for our development," he said. "All that we need is unity and peace to achieve that development." Chiwenga said Government was aware of the people's concerns and would address them. "We know you have many problems ranging from jobs, accommodation, roads and provision of clean water and sanitation," he said. "These issues are at the heart of the programmes of the Government under the new dispensation and we have tasked the Ministry of Local Government to come up with comprehensive master plans for each city so that they are modernised." Chiwenga said the over $20 billion in investment commitments that the country had received would also address job creation through the opening of new factories. "This coming week, we will be opening the Karo Platinum Mine that will see a lot of people from Norton and surrounding areas getting employment," he said. "There are other infrastructure programmes that will also benefit a lot of youths." Chiwenga said Government had opened two banks to enable youths and women access cheap loans for their projects. He hit out at land barons in Norton whom he said had fleeced people of over $5 million. "I have been told that people have lost over $5 million to land barons in the hope of getting stands," said Chiwenga. "The President has set up a commission of inquiry to investigate these issues and the law will take its course." Chiwenga urged people to maintain the peace prevailing in the country and resist attempts by the MDC-Alliance to foment violence through their planned demonstrations against the Zimbabwe Electoral Commission. "Elections will go ahead despite threats by some to stop them," he said. "There are over 133 parties, with 55 participating in elections and many independents. So, those who are saying there will be no elections, who are they? "They should know that ZEC is an independent body that is not directed by any one." MDC-Alliance presidential candidate Nelson Chamisa has been threatening to stop the elections over his unconstitutional demands on ZEC. This is despite advice he has been getting from both local and international election observers and fellow candidates to approach the courts if he feels aggrieved. Political analysts say disrupting voting is a serious breach of the law, and the law should take its course if the MDC-Alliance resorts to unlawful means to air its grievances.